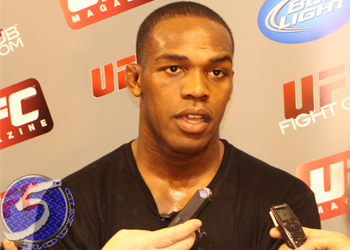 A light heavyweight title affair between champion Jon Jones (Pictured) and Rashad Evans headlined tonight’s UFC 145 pay-per-view broadcast. Philips Arena in Atlanta, Georgia is hosting tonight’s festivities. Herb Dean is the third man in the Octagon. No eye contact from Jones during the stare-down. Surprisingly, they touch gloves. They both crouch down before the war starts. Jones tags him with a head kick. Evans scores on a one-two combo. Jones counters with a powerful leg kick. The champ lands a straight elbow and follows up with a left hook. Jones hits him with two consecutive kicks to the body. Evans clocks him with a nasty head kick. Jones, 10-9. Evans scores with two knees in the clinch. Jones responds with a leg kick. He misses on a barrage and Evans takes the opportunity to showboat. Jones connects on an elbow, but eats a leg kick. “Bones” staggers him with another elbow shot. Jones is throwing elbows like they are punches, absolutely sick. He unleashes a flying knee and a left hook just before the horn blares. Jones, 10-9. Evans appears to have recovered. He clocks Jones with a big left. Jones just misses with a vicious head kick. Jones throws a flying knee and follows up with a one-two combo. Evans counters with a left hook. Jones connects with a switch kick. “Suga” attempts his first takedown to no avail. Jones, 10-9. Not too much going on in the opening three minutes of this stanza. Evans goes for a takedown and gets punished with a couple of shots to the dome. Jones nails him again with an elbow. Evans thwarts a takedown attempt. Jones, 10-9. Evans needs to go for broke, but will he risk getting put to sleep by his nemesis? Evans lands a nice leg kick, though he’s going to need more than that. Jones clobbers him with a right and then a kick to the midsection. Evans eats a knee to the chin. Jones trips him to the mat and unleashed a couple of strikes before Evans was able to get to his feet. Jones, 10-9, and runs the table, 50-45.